@pugetsoundguy DONT EVEN START O N LISA HENSON AND THE HENSON FAMILY HEY ILL HIDE BEHIND THESE PUPPETS MY DAD DREW. NOT. I had already planned to introduce my series Flashback Fridays today to discuss albums that I love and have meant a lot to me over the years. The bizarre actions and public persona of Courtney Love have somewhat obscured the fact that she was involved with one of the most brilliant albums of the 90’s – Live Through This. Artists usually come in two flavours those whose brilliance flickers briefly before abandoning its host, leaving the host to navigate the demands of the industry (Courtney) OR those who make a career out of being true to themselves. While the high points are very high indeed, the points that don’t reach those heights can hardly be called low. Today’s featured album puts the spotlight on one such artist, Mark Burgess, and a band whose debut album is one of my favorite albums ever – Script of the Bridge. 1. Don’t Fall – The album begins with a soundbite from the 1946 film Two Sisters from Boston – “In his autumn before the winter comes man’s last mad surge of youth / what on earth are you talking about” – the guitars come roaring into focus with Mark Burgess wailing “don’t fall…don’t fall” like a madman possessed. In other words – stunning so far. A rousing opener. 3. Monkeyland – Going back to my exchange with Courtney Love Cobain – wouldn’t it have been weird if the template for Nirvana existed – not with The Pixies – but with a UK guitar band in 1983? Funny you should ask – “Monkeyland” begins as a quiet song with Mark singing in an increasingly agitated tone “I shake my head and shiver / They smile and they stab my back / As they shake my hand / Send out an S.O.S please / I’m marooned in Monkeyland / Is there anyone there / Who understands me / Anyone at all?”….on for another verse in accusatory words before Mark shouts “It’s just a trick of the light! !” and the guitars explode in a Nirvana-ish wall of sound (or should we begin to say Nirvana explode in a Chameleons-ish wall of sound). Perfect. Perfect. Perfect. 4. Second Skin – In Mark’s words this song is about “dealing with the immortality of cinema stars. It evolved after I read a book about the study of ‘Near Death Experiences’ and subsequently dealt with another form of immortality altogether” This is a very haunting track with swelling synths in the background with the drums answering the lyric “Someone’s banging on my door…” For a song about the afterlife, it really makes me feel alive (silly maybe). 7. Pleasure and Pain – Along with “Monkeyland” I consider this song to be a case of The Chameleons not receiving recognition for a very specific sound 15 years ahead of when it broke big in the UK / US. Interpol have created an entire career out of mining the treasures present in this song (Full disclosure: I do love Interpol). The driving bass, eerie guitars with Mark singing about “Its pleasure and pain / no loss no gain / Again and again / pleasure and pain” and elsewhere he calls out those fake friends (we all have had them, I’m sure) “Smiling as we climb / Smiling or crocodiling” (strangely the last time I saw Mark live it was at the famous Crocodile in Seattle, WA where another band called Nirvana started to make its name as a force to be reckoned with). This all makes for a perfect song. 9. As High As You Can Go – The Chameleons and U2 shared a producer at the outset of their respective careers – Steve Lillywhite. Though he isn’t the producer on this track, this song stands out to me as a song that should have been a hit single. It reminds me of Boy era U2 with a positive vibe throughout. 11. Paper Tigers – Song starts with a chugga chugga guitar sound before building into a full band jam. Mark starts off “Too much makes me lazy /Not enough and it makes me crazy /Too much makes me crazy / Not enough and it makes me lazy” slowing building up to the chorus “You have to face them sooner or later /These tigers made of paper /Don’t pay now /You have to pay later /Confront your tigers made of paper” The song is absolute perfection. 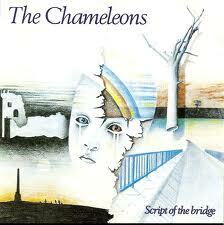 It’s about a run in The Chameleons had with the crew of Killing Joke in the early 80’s. 12. A View from a Hill – Perfect ending to a perfect album. Slower guitar sound with Mark sounding like a ghost, singing from under the floorboards (yes, that was a silly Magazine reference). The song is about Mark in his youth taking acid and climbing Tandle Hill to look out over Manchester. I’ve never taken acid but I’d imagine Mark’s lyrics describe it perfectly “Feel myself falling to the ground /Solitary silence there’s no sound /Open my eyes and look around / Colours and concepts that confound /All around” The song fades into the most beautiful epilogue of sound I’ve ever heard with isolated guitars, driving guitar, and the feeling that youth is fleeting. There you have it – my first Flashback Friday. Stay tuned next Friday as I discuss Genesis – Foxtrot. Here is some information about The Chameleons and Mark Burgess, I must say if you haven’t heard this record, please buy it TODAY. Dude, your writing re: “Monkeyland” is inspired. “Nirvana explodes in a Chameleon-ish wall of Sound!” LOVE IT! toneful, and powerful artistic dark soundscapes. This band has held up in my album collection as a treasure that I can breakout and always find solace and comfort in retrospect and current enjoyment. Thanks for reviewing this and drawing attention to a great piece of work. I knew we had a kinship Tom! Thanks for reading – this is one of my top 5 records of all time, I had the honor of seeing The Chameleons back in 2002 when they were briefly reformed and also saw ChameleonsVox (basically Mark Burgess) in Seattle a few years ago….amazing stuff! Hi Jason, I enjoyed reading. When I first heard Nirvana in the early 90s the thought struck me like a lightning bolt that Cobain had very probably heard “Don’t Fall”. It would be great to think that he did.